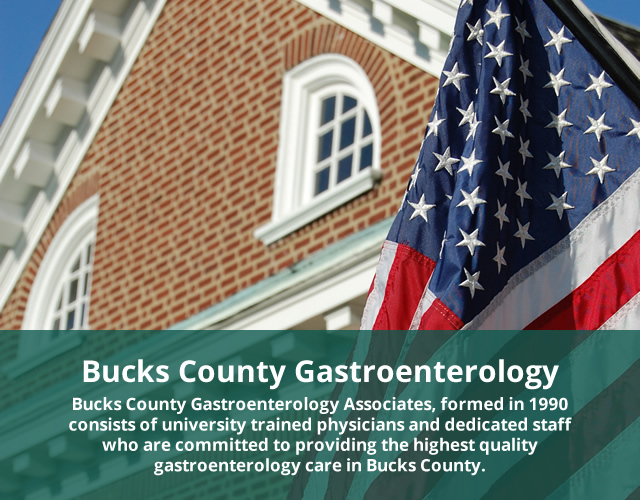 Bucks County Gastroenterology Associates, formed in 1990, consists of university trained physicians and dedicated staff who are committed to providing the highest quality gastroenterology care in Bucks County using state of the art equipment in beautiful new facilities. This website contains useful information for patients about our practice, procedures, and GI diseases. We hope you find the information provided here helpful! Colon cancer in young people has been on the rise recently. While still overall low in incidence, the rates of colon cancer has been on the rise in people under the age of 50. Because of this alarming trend the American Cancer Society issued new guidance for colon cancer screening in June, 2018 advising starting colon cancer screening for ALL patients starting at age 45. This position was supported by the president of the American Gastroenterological Association, though the main GI societies have not updated their guidelines pending further study. Most insurance companies, however, have not recognized the newer guidelines until now. Aetna recently updated its policy to recommend colon cancer screening for all patients starting at age 45. Hopefully all insurers will follow suit and recognize the importance of colon cancer screening starting at an earlier age, possibly halting this disturbing trend of increasing colon cancer rates in young people. 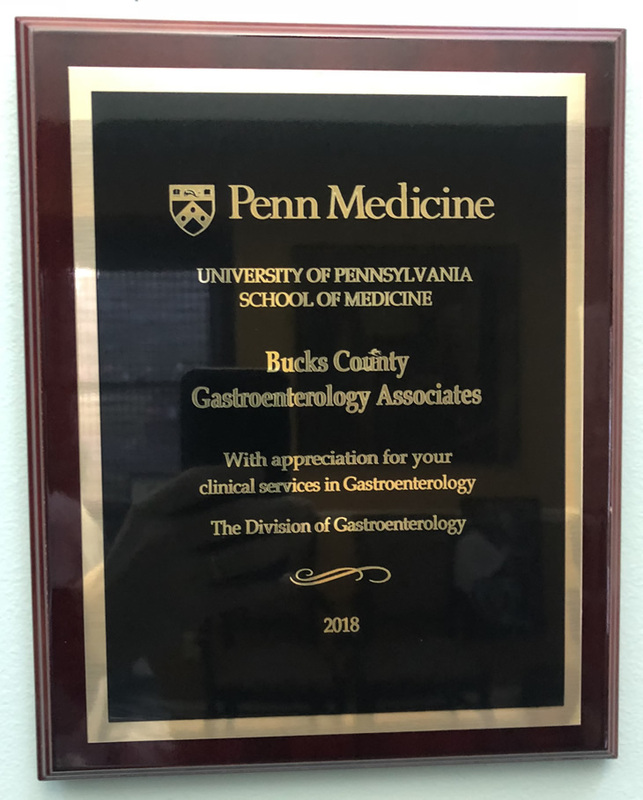 Bucks County GI Associates was recently awarded the 2018 Community GI Service Award by the Gastroenterology and Hepatology Division at the University of Pennsylvania. Dr. Popper attended the annual dinner in June at the University of Pennsylvania, where he received this distinction on behalf of BCGI for providing outstanding local GI care to the community. 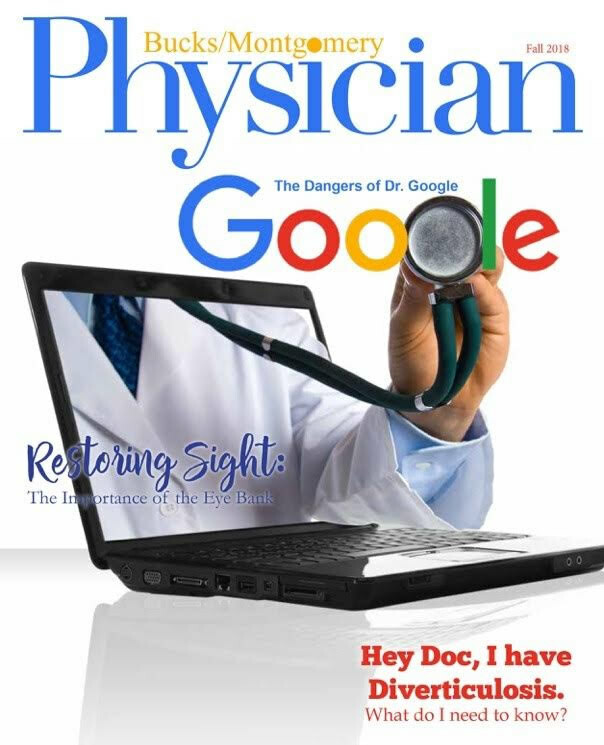 Bucks County GI Associates was the featured practice in the Fall 2018 Edition of Bucks/Montgomery Physician Magazine, the quarterly publication of the Bucks County Medical Society. The article details the physicians and history of BCGI, services provided, and what we do as a practice to provide the best available GI care to the community. Read the full article here. Drs. J. Matthew Bohning and Kenneth S. Breslin are proud members of Bucks County Gastroenterology Associates. Along with Drs. David Popper, Stephen Rafelson and Jyothi Mekapati they have provided skilled, compassionate, and comprehensive inpatient and outpatient GI care to the community for more than 25 years. Both Drs. Bohning and Breslin serve in physician leadership roles at St. Mary Medical Center, Dr. Bohning as an officer on the Medical Executive Committee and Dr. Breslin as Chief of Gastroenterology. They maintain an academic faculty appointment and have interests in advanced biliary endoscopy, general gastroenterology and hepatology. 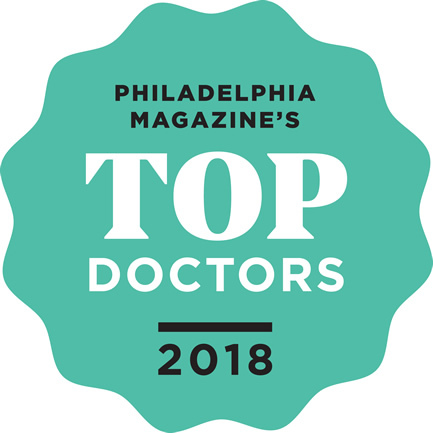 Visit Philadelphia magazine Top Doctors™ 2018 to view the entire list. Colon cancer is the second leading cancer killer in the Unites States, with 136,000 new cases diagnosed each year. The odds of developing colon cancer in your lifetime is 1 in 20. Having a colonoscopy with removal of pre-cancerous polyps reduces that cancer risk by 90%! Colonoscopy should be considered a colon cancer prevention test, not just to detect cancer at an early stage. 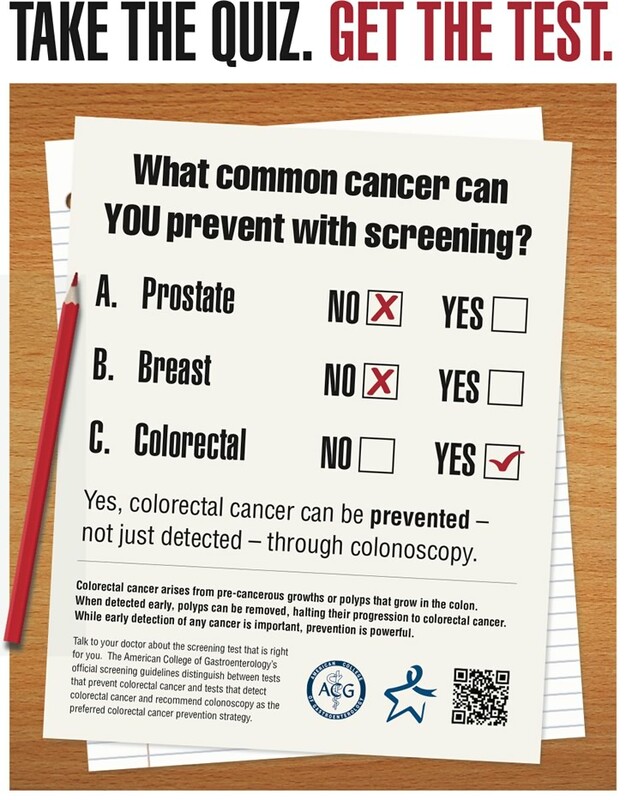 For people at average risk of cancer (without family history of colon cancer or polyps) screening colonoscopy should start at age 50 (45 for African Americans). Talk with your physician about colon cancer screening, and make sure you are not one of the almost 23 million people in America who have not had colon cancer screening. Visit http://patients.gi.org/topics/colorectal-cancer/ for more information. Bucks County GI Associates is now proud to offer the CRH O’Regan System for the treatment of hemorrhoids. Bucks County Gastroenterology Associates, PC has created a secure patient portal for your convenience. The patient portal is a secure and convenient way to communicate with our office and access portions of your medical record. The portal is available at any time, allows you to bypass the phone system, and communicate with us at your convenience. This procedure enables the physician to see and treat disorders of the colon, and is the cornerstone for colon cancer screening. Visualization of the esophagus and stomach is key for the diagnosis and treatment of common disorders such as GERD and ulcers. ERCP is used both in the diagnosis and treatment of many pancreatic and biliary diseases. The capsule is a camera with the size and shape of a pill used to visualize parts of the gastrointestinal tract not accessible by EGD or colonoscopy.